Sue Alun-Jones writes to inform us of the death of her father, Thomas William George Farmer. Mr Farmer was born on 11 February 1930 and attended Bournemouth School in the 1940s. He died peacefully on 21 July 2016. A funeral service will be held on Thursday 4 August 2016 at 2.00pm at St Michael and All Angels, Highclere, near Newbury. We are saddened to learn of the death of Brian Tomlinson (1940-48), who died last weekend. He played for both the football and cricket sides for the Old Bournemouthians and in later years helped to run the Saturday football team. Mr Tomlinson’s funeral will be held at Christchurch Priory at noon on Wednesday 27th May. Hugh Walker recently got in touch with the OBA. He had discovered a number of photographs and documents left by his father, Bernard Walker, who designed sets for a wide range of school productions from the 1930s until his retirement in the 1960s. You will find the photographs below. Let us know in the comments if you recognise anybody – or yourself! 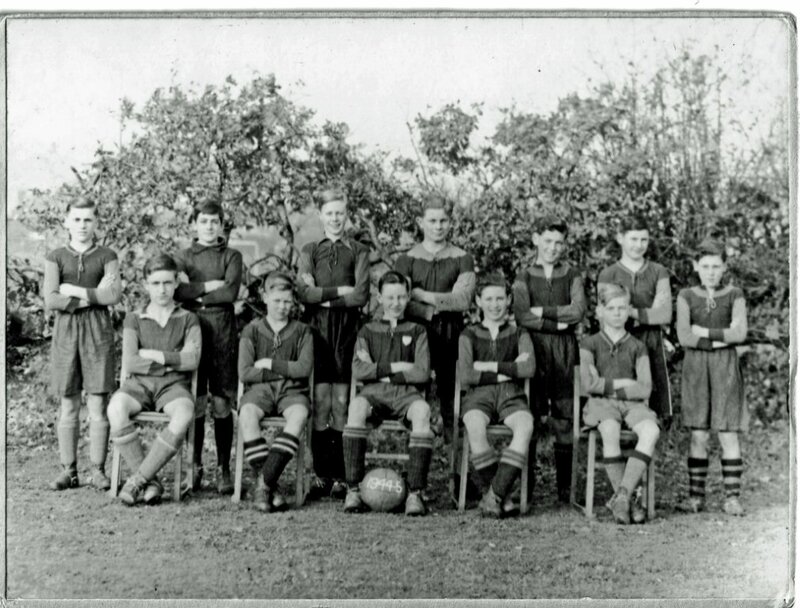 [I] Have just unearthed another old photo which I am sure is the Under 13’s soccer team from 1944. Recalling the names of these is a bit more difficult. 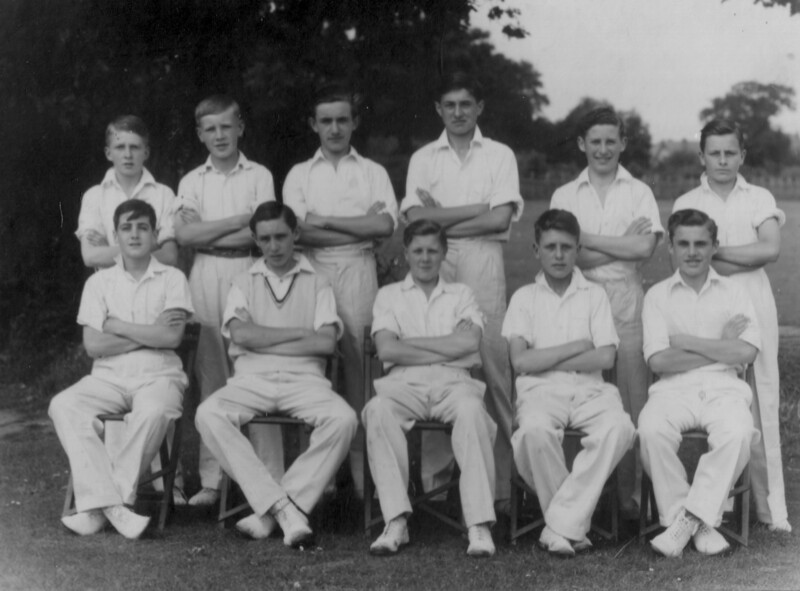 The three in the centre of the front row are Doug Sherwood, Peter Close and Jim Ridout. I am second from the left in the back row (Goalkeeper). I do hope some of these fellows are still on the right side of the fairway. Do get in touch if you can fill in any of the gaps, or know the location of any of these Old Boys. The picture above was sent in by Len James, who was at Bournemouth School between 1942 and 1947. Len moved to Australia in 1952. He emailed us, saying that he had recently discovered the Old Boys website and was fascinated with the memories of past teachers and fellow scholars. Can anyone fill in the gaps? Eric Sidwick writes that Dr Michael Hirons has passed away. Mike was a Head Prefect at the school during the late 1940s and early 1950s. Later he became a GP in Winton. We do not have funeral information. I write on behalf of a friend of mine who was a pupil at your school 1939 to 1946. His name is John Douglas Jones who at the age of 80+ is still very active and living in Clifton, Bristol. Doug has only recently had to give up flying his sailplane at the Bristol & Gloucestershire Gliding Club. In the course of a conversation yesterday about schools we attended, Doug said he can remember the names of all his teachers during his time at your school except the name of the English Literature master. Doug would be interested if anyone might be able to remember this teacher’s name. Graham Keeling has found and scanned this photograph of everyone in Bournemouth School at on 31st May 1946. A full version of the picture can be viewed at Graham’s site.